What’s a great party without nachos? 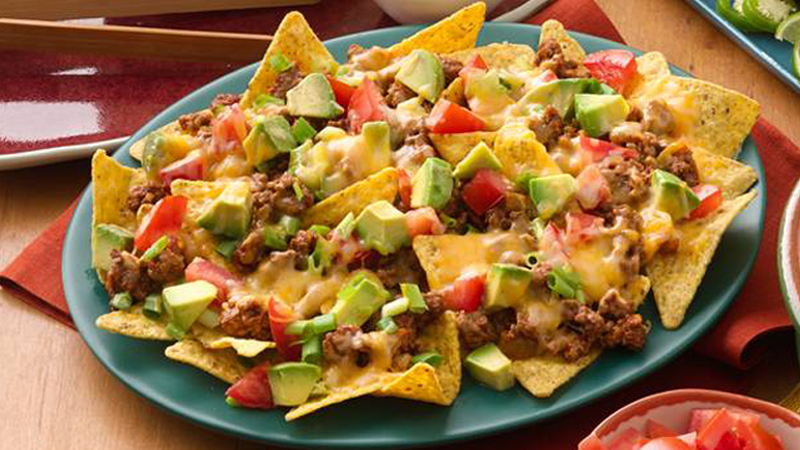 These spicy beef nachos are simple to make and can easily be doubled up to serve a crowd! 1. Preheat the oven to 200°C (180°C for fan assisted ovens), gas mark 6. Line a large baking sheet with foil and lightly grease the foil. 2. Heat the oil in a large non-stick frying pan over a medium heat and add the beef mince. Fry for 7-8 minutes, stirring frequently until browned. Stir in the jalapeños and taco seasoning mix and fry for 10 minutes or until the mince is cooked through. 3. Spread half the tortilla chips in a large circle on the baking sheet. Spoon over half the beef mixture, tomatoes and spring onions. Top with the rest of the tortillas, beef mixture, tomatoes and spring onions. Scatter over the cheese. 4. Bake for 10-12 minutes until the cheese has melted. Top with the avocado and serve with soured cream, if liked. • Instead of avocado top with Old El Paso™ sliced red or green jalapenos to give an extra fiery flavour. • You can cook the beef mince mixture a day in advance. Allow to cool completely then cover and refrigerate overnight. Reheat in the microwave until piping hot.